As most of my followers know, I sell consignment, and some new, as well as vintage clothing through an app called Poshmark (I’m called @vacat). If you don’t know, there will be a blog post on that later. If you’re a fellow posher, I hope you’ll enjoy this. For the sake of this blog, let’s assume you are! So, you’re a Poshmark fanatic and you’ve decided you want to finally meet some local poshers. A live Meet & Greet is your answer. I highly recommend this for every posher. There’s NO better way to actually get to know each other, put a face with a name when you’re chatting on Poshmark, find all the poshers in your area, and perchance even make new real life friends. 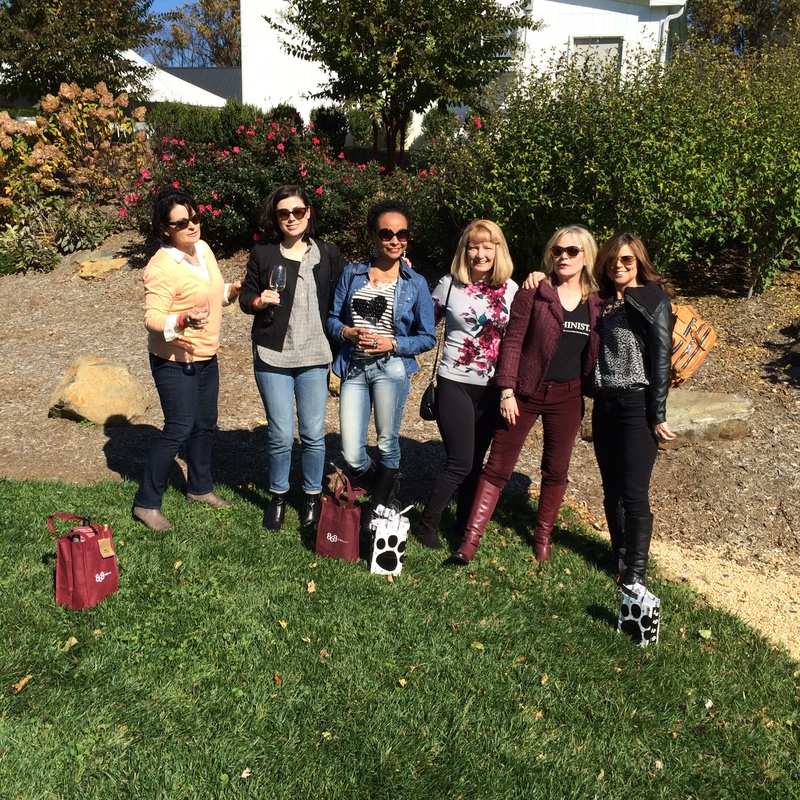 Last Saturday, October 25, I hosted a Meet & Greet wine tour in the Virginia Blue Ridge Mountains. Yes, Virginia there is beautiful autumn foliage and yes there is award winning vineyards in them thar hills!!! First, it’s important to note that this was an intimate (read that as small) get together, but it was a huge success. Lesson 1) keep the gathering intimate so you can REALLY talk. Over various wine pairings, breads and cheeses, we shared stories of our birthplaces, families, marriages, locations we had lived, and of course poshing. No loud music, no games, no inebriated men to hit on us. Ok, maybe we are old, but it does still happen! See, you’re laughing already and you weren’t even there. How did we accomplish this? Glad you asked because I learned it’s not as easy as it seems to teleport “virtual” people into “real” people in one location. So, there are other lessons embedded here. This is not a PowerPoint bulleted presentation – stay awake! 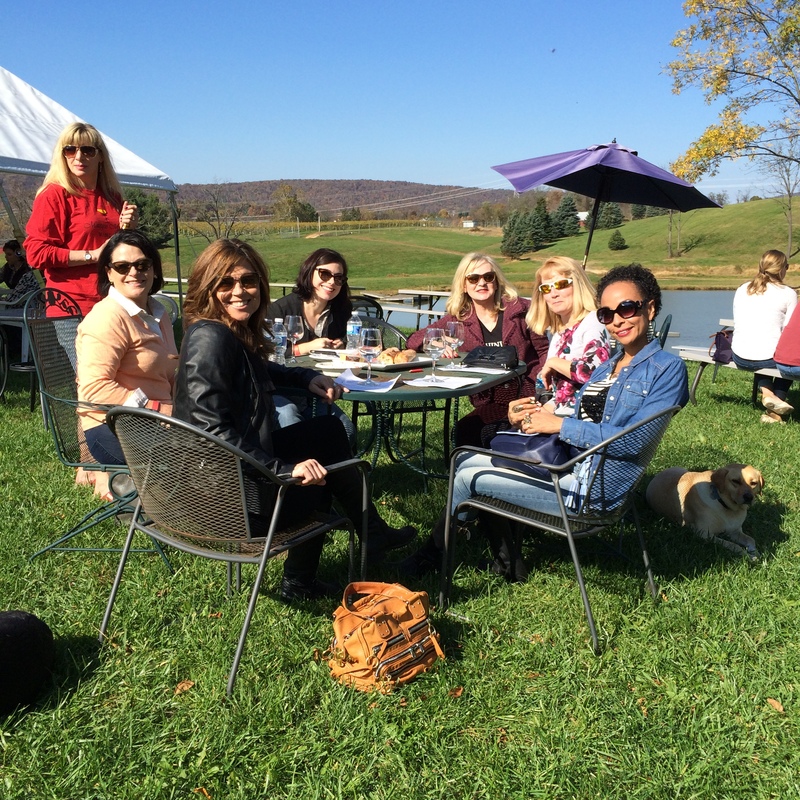 To determine if there was any interest, I put out feelers last Autumn about a wine tour. When I had determined that there were actually dozens of poshers interested, I posted an invite on Poshmark. Lesson 2) find out if anyone is interested in attending and don’t just assume that because you like the location everyone else will. Everyone loves you on-line, but maybe not enough to endure a mariachi band in real life. Since the states are so small up here (sorry, but I’m a Texan and I haven’t gotten used to being in three states in less than hour! ), I added the surrounding states in the title. Lesson 3) include abbreviations for the surrounding states. You never know if someone from another state might see the invite and be willing to make the drive. I posted the invite eight weeks in advance. Lesson 4) give everyone plenty of time to arrange their hectic schedules, find babysitters, etc. Of course, if you live in a very urban area, you can probably just call poshers you already know and pull together an impromptu meeting anytime – this is not for you! This is how to get to that stage. Since the vineyards are a ninety minute drive from DC, I arranged for everyone to call in and book their seats on a tour bus. Three ladies actually bought their tour bus tickets in time before the bus was filled with wide-eyed tourists. The others decided to drive so they could enjoy the scenery and make stops (shopping perhaps?) along the route. Lesson 5) clearly post time frames for RSVP and advise everyone of transportation, then pray they heed your advice. (Note: if you’re an attendee, be courteous to your host and make certain you can afford the bus ticket or taxi fare to the destination! Everyone loves you, but not enough to be your chauffeur). About two weeks in advance, I emailed Poshmark and requested swag for the event. 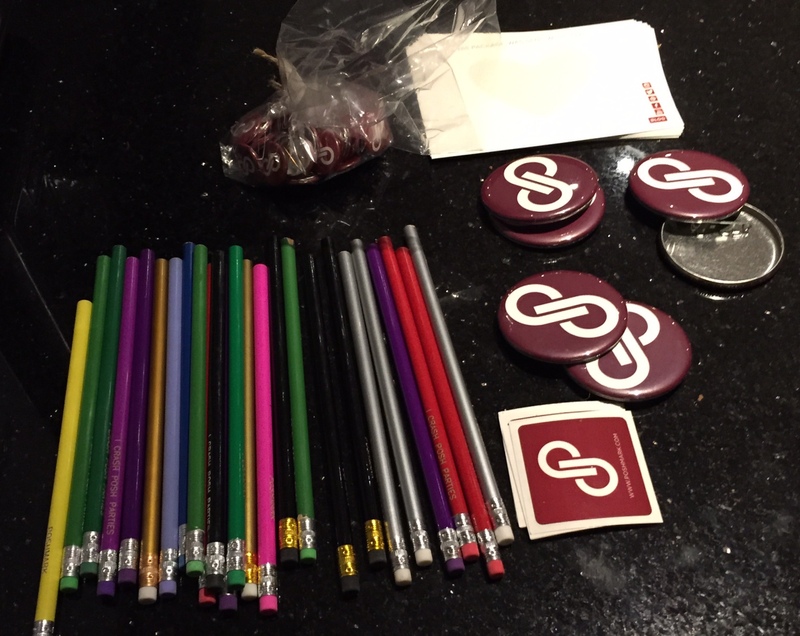 They provided pins, shipping cards, stickers, and pencils. Nice touches for the parting gift bags, but it needed a personal touch. 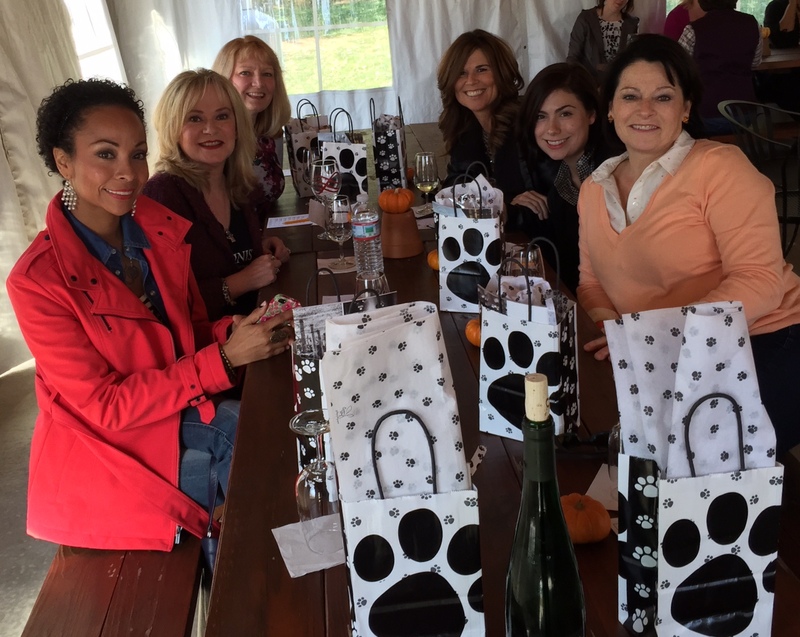 I added a silver wine glass charm (fashion themed of course), homemade pumpkin cookies, and brochures of the wine country all in my signature paw print bags and tissue. My lovely fellow posher Virginia (yes, that’s her real name – coincidence, hmm), who is @cody7150 on Poshmark, hand painted wine glasses for the bags. Lesson 6) get the swag and put together themed parting gift bags with added personal touches. Let others contribute, if they ask. Your guests will be treated to something they can cherish long after the event is over. Truth be told, we had a few issues. About half of the committed attendees had a change in plan, the pairings at the first vineyard were not enough to substitute for lunch (my bad – as I believed them without seeing it first for myself and they wouldn’t let me cater the event). Lesson 7) do a test run by yourself to make sure everything is actually as described by the provider. Still, we had so much fun and I am now blessed with new real life friends. As you can see from these pictures, we started the day very proper. By the time we reached the second vineyard, everyone was much more relaxed. Strangers no more – friends always! The best lesson: post the invite, stick to the RSVP date, show up, don’t worry about the cancellations (be prepared to just absorb those lost dollars), relax, and HAVE FUN!! It’s a party, not a ninja special op! Oh wait, that’s me!!!! Resale MCommerce: Who Sets the Price? M-commerce & Social is Successful! Do We Really Want It? A colorful assortment of fashion dreams, health, travels, and a journey to sustainable living.